5 Bedroom, Plus 100 M2 Loft, 5 Bathrooms, Garage, Garden With Swimming Pool! This stunning family home with a swimming pool, 20 minutes north of the city center, is close to parks and a large shopping mall, and has an annex at the end of the garden to suit a nanny or grandparents. The house includes a laundry area with washer-dryer and a kitchen with dishwasher. The owner’s brother is a qualified chef and can offer catering on request; the terrace outside the living room has a barbecue area for classic Argentinean feasts. There is a loft at the end of the garden with bedroom, bathroom and dining table ideal for a nanny or au pair. For evening entertainment, the hosts have a DVD collection of their favorite movies. The location is great, close to a park, 20 minutes by car from the center of the city and with a gym 5 blocks from the house. Local restaurants offer everything from sushi to Argentinean meat. The garden has a large swimming pool. There is plenty of space for all the family with big bedrooms and easy living spaces. All the sheets have been hand made with Percal Cotton. The bathrooms include a bathtub and the kitchen it incredibly well set up for family dining. The location is easy with kids: there is a park under 10 minutes’ walk away with an antique carousel, and a large mall 5 minutes away with shops, cinema and restaurants, which may suit teens. The city center itself can be reached by car, bus or metro in 20-35 minutes and has plenty to entertain kids including museums, ice cream cafés and characterful squares. Tecnopolis nearby is a government-funded science, technology and art exhibition center geared mainly towards children but enjoyable for all ages. A crib, high chair, and a baby bath can be provided on request; note that stairs are not gated. Minimum stay: 4 nights. There is parking directly outside the house. There is an electric fence and security camera system for safety, and a police station 2 blocks from the house. Smoking allowed outside the house only. Weekly maid service included for stays over 7 days. The residence is in Saavedra, a quiet and residential city neighborhood between Capital Federal and Buenos Aires Province in Argentina. Twenty minutes by car from the city center, the town includes 2 large parks and DOT Baires, the largest shopping center in Buenos Aires. It is mainly a residential zone; family attractions include Parque Saavedra, which has a children’s playground, bicycle path and occasional festivals and events, and Parque Sarmiento, a 70-hectare park with swimming pools, roller-skating rinks, BMX ramps, tennis courts and more. The city’s airport is a 35-minute drive away. This house includes a main floor with fully equipped kitchen, dining area for 10-12 people, and an office/bedroom, plus WC. All the other bedrooms are on the upper floor: a master bedroom with ensuite bathroom and walk-in closet, a second bedroom with kingsize bed and a third bedroom. All the bedrooms are designed around a different theme, from polo to shabby chic and masculine. The third floor has a terrace with a washer-dryer. There is a garden, swimming pool and barbecue area. At the end of the garden, there is a 100 sqm loft with a bedroom, bathroom and TV plus table for 6. Modern luxury. This stunning contemporary home has recently been refurbished, and includes trinkets collected from international trips, along with Argentinean antiques. The host used to have a private restaurant in the house, so the kitchen is designed to the highest standard. Special items include an antique mirrors, golden cages containing porcelain Lladro figurines, and a chandelier from the 1950s. The office/bedroom has an imperial desk from the 18th century and an Italian chandelier with Rocca Crystals. We love extravagance and unique touches, the 4-poster bed in the master bedroom and the large swimming pool, perfect after a day’s sightseeing in the city. This is a house that we built in 2008 for ourselves. We are chefs and used to use the house to invite exclusive guests from our intimate circle. I have decided to move to Germany, and the house is exactly as it was when where were living there. We like interior design, architecture and we love the good life. This house is ready to enjoy as your home away from home. The house was equipped to be a 5 star property by a well-known interior designer. The Zen Garden was designed to enjoy the peacefulness only 15 minutes from downtown, but 400 mts away from a luxurious Shopping Mall. Please note Housekeeper is included for stays over a week. Renting this home for an expected 6 months was a disappointing mistake. The home was in need of serious work, some of which was done during our stay, but some - such as removing and replacing peeling paint and mold - could not feasibly be done while we lived there. The location is very noisy, being on one of the busiest highways in Buenos Aires. The swimming pool filtration and heating systems were not functional. The bedding was stained. Some doors did not close or lock. The casita or pool house was unlivable. After making an initial payment through VRBO, we made two additional payments to the owner, covering rent through mid-January, 2018. However, the home's condition and the owner's increasingly hostile responses to our attempts to cut short our stay, led us to flee in late November. VRBO and similar rentals are not, in my opinion, a good choice for longer term stays, since one's payment choices are either to pay all up front or arrange a payment schedule through the owner as we did. As a result, we paid rent for time we could not remain in the house, plus the security deposit we never got back. We have rented numerous homes for shorter periods of 1 - 2 weeks and have had only one other bad experience. We have always received glowing recommendations from owners. We made a serious mistake with this house and are out considerable money therefore. Had a great time, house and garden were exactly as described. Was great. Thank you Andrew and Naty for taking care of my house! I look forward to assisting you in the near future! Have a great Year! beautiful house had everything the owners made us feel right at home. Dear Christian, thank you for choosing my house! We hope to assist you soon again! It was a pleassure to have you as a guest! Carmen was welcoming and very helpful with the process of organizing the trip. The house was beautiful and modern. We stayed with 3 couples and had plenty of space. The house is across from the highway, but the back rooms were quiet. Easy to get a taxi about a 7 minute walk from the house at the Dot Shopping Mall. Great place to stay in Buenos Aires...but definitely need taxis to to get to Palermo, San Telmo, etc. Jodie, thank you so much for taking care of my house! You were all great guests, I would love to assist you in the near future! The host was very helpful with touring us through their home, showing us where everything was, and being very responsive when we needed anything throughout our stay. The home was very spacious and comfortable, perfect for any type of group. Thank you again! Thank you so much Robert! It was a pleasure to help you all! Thank you for taking care of my house and really hope to assist you in the near future! La casa está al detalle! Las camas son muy cómodas y todas las habitaciones disponen de aire acondicionado. La comunicación con Liliana fue genial, muy atenta. Disponiamos hasta de desmaquillante y algodones! Nunca lo había tenido en una casa de alquiler! El alojamiento es de lujo, enchufes adaptados a los europeos y la sala de ocio es perfecta para pasar buenos momentos! Volvería a esta casa sin ninguna duda! Muchas gracias Lorena! Tu grupo ha sido maravilloso! Espero poder asistirlos en un futuro cercano! 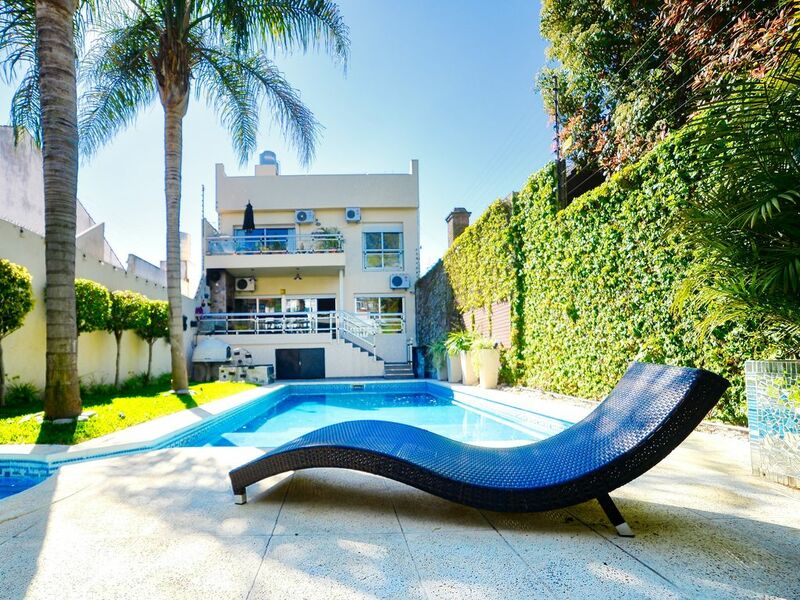 The house is located only 400 mts away from Baires Dot Shopping Mall, one of the biggest shopping malls of Buenos Aires.You can enjoy shopping, and many bars and restaurants with the best gastronomy of Buenos Aires. It also offers a Cinema, with an exclusive VIP SALON, a Premium Class and unique cinema to enjoy dinner with confortable reclinable sits. If you are looking for a beauty Salon, it offers one of the best options in town. The mall is open everyday from 10 am to 10 pm, and to 1 am the Cinemas!